Yule or the Midwinter Solstice is the time of year when we experience our shortest day and longest night – the sun is at its lowest point in the sky at noon. Yule meaning ‘wheel’ is one of the oldest winter celebrations in the world. 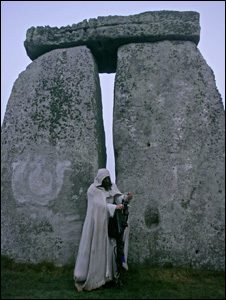 In Wiltshire the winter solstice is still celebrated by the lighting up of the white horse at Alton Barnes. Tea lights in jars are placed on the chalk, so that the horse glows with candlelight. New Year’s Eve was the traditional time that this ceremony took place, and was originally held around the oldest tree in the apple orchard. The first cider crop was poured on the roots of the apple tree to thank the tree spirits for the crop of apples, and to ensure a good harvest next year. Drumming and bamging sticks would beat away any bad spirits, and the wassail cup would be passed around. Toast dipped in cider would then be hung on the oldest tree, as an offering to the tree dryads. ‘Wassail’ was Saxon for ‘good health’. 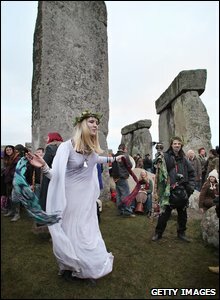 Our ancestors celebrated the rebirth of the Sun god at Yule, and the expulsion of the evil winter spirits. The winter solstice was considered a mysterious and powerful time, for it is at this point the sun begins to make the return journey across our skies. After the longest night of the year the sun is seen as growing stronger and the return of the warmer season is welcomed – the concept of rebirth became strongly associated with the Winter Solstice. Three days after Yule many people exchange gifts and celebrate Christmas – the birth of Jesus, as our ancestors celebrated the return of light and the sun growing in strength. The well-known figure of Father Christmas may have derived from the Pagan god, Herne the Hunter. Yule was celebrated with bonfires to stimulate the ascent of the sun, and lamps illuminated houses decorated with evergreens to simulate summer. It is a time to look on the past year’s achievements. The days will now grow longer up to the mid summer solstice. The Yule Log – during medieval times, the decorated log was ceremoniously carried into the home on Christmas Eve, and placed in the fireplace. Traditionally the Yule log was lit with the saved stump of last year’s log, and then it was burnt over the twelve days of the winter celebration, and its ashes and stump were kept until the following year to sprinkle on the new log, so that the fortune would be passed on from year to year. In France and Germany ashes from the Yule log were mixed with the cattle feed to ensure their health and in other regions the ash was sprinkled around fruit trees to increase their yield of fruit.